Sydney Shop Girl: News From New Orleans #5: Orlando. From the Perspective of an Australian Slashie. News From New Orleans #5: Orlando. From the Perspective of an Australian Slashie. The skies are grey over New Orleans today. In light of the events of this past weekend, I thought I'd deviate from the usual themes of my US posts and reflect. Even as an Australian, 640 miles away from Orlando, it's hard not to think about the glaringly obvious in light of Sunday morning's mass shooting. Why is it so hard for the NRA to agree to legislation to protect the citizens it claims to represent? Not a complete ban on gun ownership but tighter restrictions for those who are of interest to the government for matters relating to terrorism and hate. That this most recent attack occurred in what has been a safe haven for the LGBT community has added further complexity to the usual discussions that to and fro about terrorism and gun ownership. But perhaps because this attack targeted a community that has loved all and stood united in the face of prejudice and bigotry since long before IS reached our collective consciousness is the reason we have seen more examples of love and reaching out than acts of revenge and hate in these painful days that have followed. 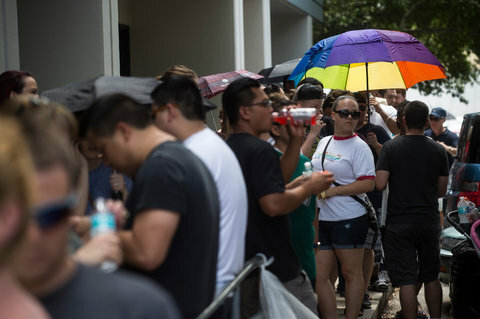 The people of Orlando have flooded their local blood collection centres willing to donate their blood to help the fifty wounded. 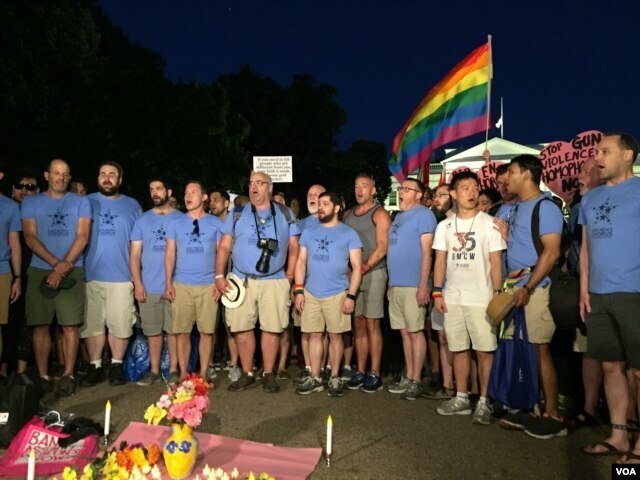 And the Gay Men's Chorus of Washington conducted a vigil outside the White House to honour those who lost their lives. I've been fortunate to have visited the US a few times in recent years and have been lucky that these trips have seen me live (as a conference delegate / outlet shopper / tourist aka Australian slashie) in different regions of the country. However, visiting as an Aussie slashie has given me a perspective of the cities I've visited that is often far removed from how the majority of Americans live. I've sensed this on previous trips but data presented at lectures I attended today have crystallised what my instincts told me. I'd like to devote the rest of this post to what I've learned about what it means to live in America for a startlingly large percentage of those who call this beautiful land of the free their home. 5.25 am of a weekday, that's the time you get to a Hilton hotel gym in the US to be guaranteed a treadmill. Thanks to a well appointed gym and hotel cafe, I have been able to transplant my usual morning routine in Sydney across the Pacific Ocean to New Orleans. I'm struggling with how sweet Raisin Bran Crunch is (it wasn't this sweet in New York last year...) and the fact that full fat milk is the only option but a girl can live with that if heavily discounted active wear from Aeropostale are involved. $20 AUD per pair! No more boring black active wear for me... No more $90 designer gear whose silver trimming melts off after two washes..... I'm all good about that, truly I am. But seriously, and getting back on point. It's awfully hard to find fresh fruit and vegetables at food outlets outside of hotels and upscale shopping centres in this city. This abundant supply of fruit and muesli bars for example, wasn't found in a local supermarket as you would do in Sydney but rather at the race preparation area for participants of the weekend's run. It was the only time I saw fresh fruit outside of the hotel and conference venue in New Orleans. Food insecurity (the uncertain or limited access to good quality food) is an enormous and serious problem in the US. 15% of American households experience in food security, 17.3% of households in Louisiana fall in this category. The prevalence in the Orleans parish where I'm staying? 23.7%. For reference in Australia, the only figure I have is from 2004 and it's in single digits - 5%. The reasons for food insecurity are complex but many are rooted in being part of the low income population of this country. Trades offs between healthier food and paying other necessities like the electricity bill are made month in and month out. Coping strategies like buying instant noodles rather than broccoli are employed not out of ignorance about the virtues of greens but consciously because the noodles are cheap and filling and often preferred by the children under the care of the food buyer of the household. This chicken strip meal cost $12 USD at the local food court and I didn't feel the need to eat again for another 12 hours. Non profit, federal fund supported initiatives like Feeding America are working together with local communities to address consumer driven concerns about chronic illnesses like diabetes as well as providing access to good quality food to those who need it. In partnership with the community, Feeding America and other agencies have helped educate diabetics about managing their disease in the context of often less than ideal living situations and producing outcomes that are often better than those achieved with medication alone. The government funded What's Cooking USDA Mixing Bowl is a website full of useful ideas and recipes for healthy eating when time and finances are tight. At the risk of sounding insensitive and very sheltered in my relative privilege, do you ever pause to think about what it's like for 'real' people living in the cities you tourist through? Inequality. Insecurity. Poverty. Hate. Disastrous, unfair and unnecessary . Isn't the same thing happening here in Australia? Obesity and diabetes is increasing here at an alarming rate. Good point and true. Type 2 diabetes is a global epidemic as well and it was interesting to learn about the situation in the US and some of the things they have been doing at a community level to help patients become more empowered in managing their disease. We truly are a lucky country. Fortunately in Australia, most of us also want our fellow Australians to have access to real food and shelter and are happy to pay taxes and have the government intervene. Unfortunately I don't this sentiment is quite as strong in the USA (in my humble opinion). As a citizen of the U.S., I can honestly say, that the cost for freshly grown fruits and vegetables (organic or not) is a lot more, than when I was growning up (I live in Savannah, Georgia). I remember going to a local farmer's market as a child with my mom (and younger siblings) and she would buy what she needed for the week, spending maybe $20-30 USD. You see less farmer's markets now unless you live about 30 miles from town or live in a farm town. The cost of living has risen in the last 20 years alone. When I was living on my own over nine years ago, a weeks worth of groceries for myself and boyfriend at the time, was $150 USD. Now it's almost $250 USD, and that is just food for the week (i.e.meat products, cereals, fruits and vegetables). This is a reason why so many people in the States rather go for fast food or other processed food because it's cheaper and doesn't take as long to cook. Being that my daughter and I live with my visually impaired mother, we don't eat out. My mother and I are trying to set an example to my daughter to show that food eaten at home is better than eating out (and the fact that we can't afford to eat out everyday). Thanks for your perspective, Tracie. I love reading your posts about life in Australia with your son. It's always to nice see a positive outlook and what's going on in other areas outside the United States .